As a local business owner, you obviously want more customers coming to your store. What better way to get these local customers than to get it for free? That’s exactly what high local search engine rankings promise: free, targeted traffic coming in from relevant searches made on Google and Bing by prospective local customers. Today, we’ll share a step-by-step process to rank your local store higher in search engines. Note: This post is only relevant if you have a physical location. If you have an online-only business, refer to our E-Commerce Guide to SEO instead. Search Engine Optimization comes in two flavors: regular SEO and local SEO. Regular SEO deals with search engine queries that don’t have any explicit locational component. Think of searches like Chinese food recipes or best history books. The results for these queries don’t depend on your location. If you sell only online and deliver all across the country, you’d want to focus on regular SEO. In Local SEO, however, you’re dealing with queries that have an explicit locational component. 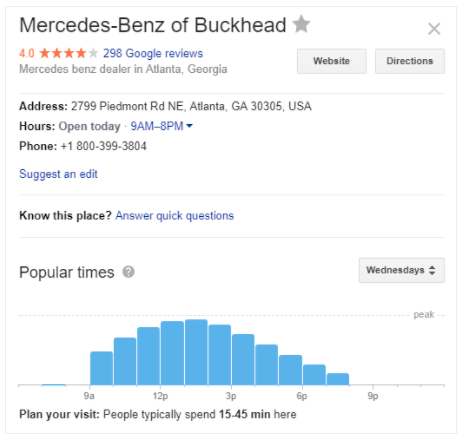 Think of searches like best auto repair shop in Atlanta or defense attorneys in New York. Queries like Chinese restaurants are local as well since Google infers you’re looking for restaurants in your city. If your business has a local presence and uses its online store/website to complement the local business, you’d focus on local SEO. A number of factors affect your website’s rankings. No one knows what these factors are exactly, except for Google and Bing. The best we can do is to estimate based on experience and data. Some of these factors have a bigger impact on rankings than others. So which ones should you focus on first? Easy: pick the lowest hanging fruit first. These are usually easy to follow tasks that require minimal effort and yield outsized results. In case of local SEO, data shows that Business Signals and On-Page Signals have a big impact on rankings. Improving these is simply a matter of making some minor edits on your site. Linking Signals also have a big ranking impact, but getting links to your store isn’t always easy. Thus, improving Business and On-Page signals would be your low-hanging fruit with local SEO. Fix things on your own site. Fix things away from your site. Let’s discuss how you can improve these, and more for your local online store below. In SEO terminology, on-page signals refers to page-specific indicators of a website’s relevance. 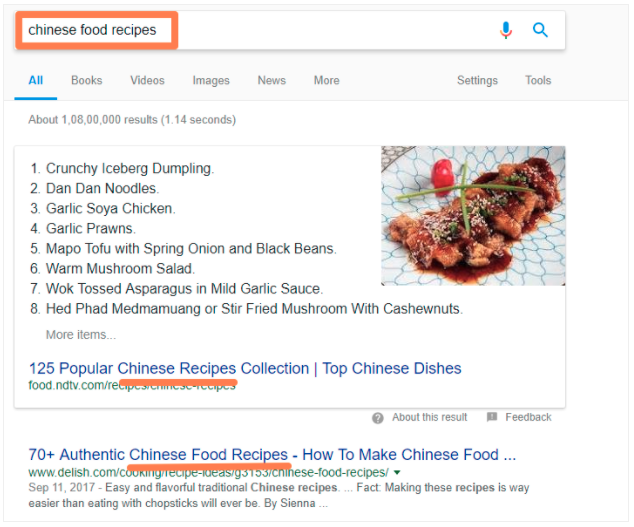 If someone searches for Chinese food recipes, any website that has these keywords in its title would have a higher chance of ranking than a page about Car modifications and improvements. It’s much easier to improve on-page signals since it simply involves editing your website to show accurate, updated information. I’ll show you how to optimize your Ecwid store’s on-page signals for better local rankings below. A recognizable name for your business. This is what people will search for when they look you up. A clear value proposition that hits on your major keywords. This should be 2-3 sentences at most. You’ll use this as the base for your meta descriptions, business listings, etc. The site’s description further highlights the business’ target keywords and value proposition. Write these down for your own business before jumping to the next step. The second thing you’ll want to do is to fill out all the relevant SEO details for your store and its products. 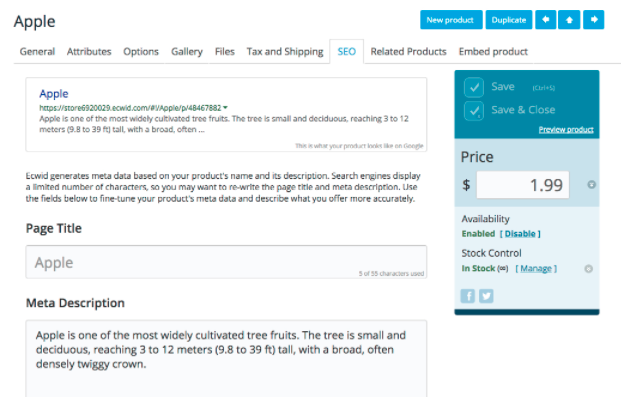 In Ecwid, you can find these details by going to Catalog → Products → Product edit page → SEO tab. Here, you can change the product’s title and meta description. Besides the name of the product, you want both the title and meta description to contain your target keywords as well. Your goal should be to target all possible long-tail keyword (i.e. keywords with 3 or more words) combinations. If someone searches for rose wedding floral arrangements in Atlanta, your site has a chance of showing up because you’ve used these keywords on your product page. A sitemap is a list of all the links on your website — a map of your site for search engine robots. Sitemaps make it easier for search engines to crawl and index your website. The easier the site is to crawl, the faster search engines can discover your pages and rank them. 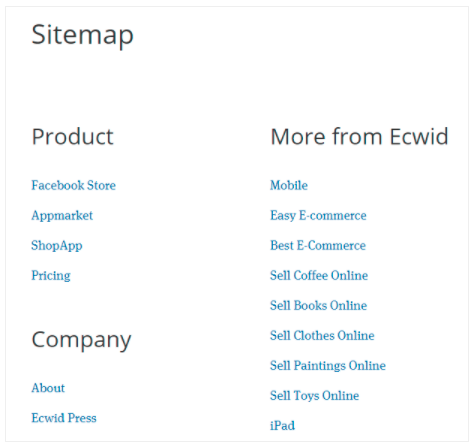 Adding a sitemap to your Ecwid store is easy — just install the Sitemap Generator app to create the sitemap in minutes. Google Webmasters (or Webmaster Console) is a tool for website owners to get better search visibility information about their sites. While it won’t directly improve your site rankings, it can tell you what queries you’re ranking for, whether there are any crawling issues with your site, and what you can do to improve your search presence. Follow the instructions to add your site to Webmasters. Once you’ve generated your sitemap, you can also add it to the Webmaster Console. This will make it easier for Google to index your site. When you add any product to your store, make sure that the product name and description are SEO-friendly. What do I mean when I say SEO-friendly? The product name/description should have relevant keywords. The keywords must be placed at or near the beginning. Place yourself in a customer’s shoes. Think of how they might find a product online. 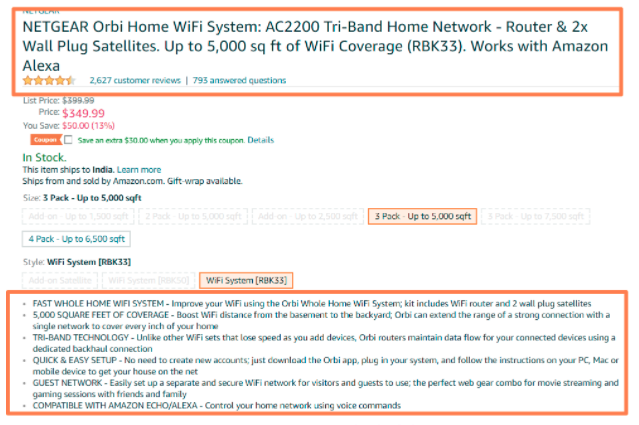 Doing a search for a general keyword which eventually brings them to your product page (such as How to improve Wifi speed). Ideally, your product name and description should cater to all these types of searches. You should have the exact product name and product category in the product title. Your product description should include a few keywords related to the product and benefits and features that users might search for. In the above case, a person looking to improve WiFi speed might be told to buy a new router. Additionally, use original content where possible, including writing your own product descriptions and taking your own product pictures. Just take care to not overload the description with keywords. Your primary focus should still be on appealing to real people, not search engine bots. Hashes, exclamation marks, special characters — they all make your URLs difficult to read and index by search engine bots. Avoid using such characters in your URLs. If you’re using Ecwid, you have the option to enable clean URLs for your site. Not running a mobile-friendly website is one of the worst things you can do for your website in terms of SEO. Google has told webmasters the same in no uncertain terms: mobile-friendliness impacts your rankings. Fortunately, if you’re using Ecwid, this problem is taken care of for you. Your store has mobile-friendliness built-in. If you’re using an Ecwid Starter Site, it will also be mobile-friendly by default. Finally, make sure that you’re collecting reviews from customers. Not only do reviews help customers make decisions, they also improve your SEO by increasing the amount of relevant content on the page. Further, reviews show up in search results, further improving click-through rates from search engines. You can use a number of tools to capture and display reviews on your Ecwid store. Here’s a short list of some of these tools for collecting reviews. This takes care of on-page SEO. In the next section, we’ll show you how to improve your business listing to improve local search engine rankings. Search engines care deeply about showing only the most relevant results to their users. 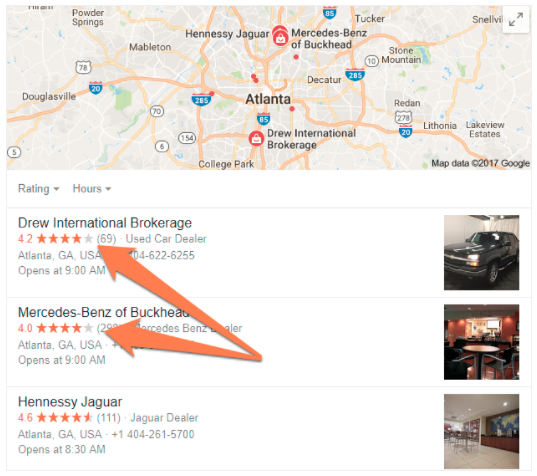 If someone searches for car dealers in Atlanta, Google and Bing want to show them results near their location, not in Boston. This is why it is crucial that you share relevant information with search engines. You need to tell Google and Bing exactly where you’re located, what you sell, and what time you’re open. 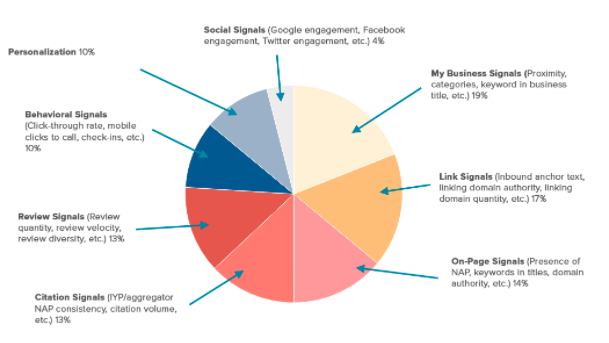 Together, these make My Business signals in local SEO. Both Google and Bing make it easy for businesses to share relevant information about themselves. Google’s program is called My Business, while Bing’s is called Bing Places. Register for both these programs by following the above URLs. Prioritize Google My Business (‘GMB’ for short) since Google dominates the search market. You’ll be asked to fill in a number of details when you create this page, such as address, phone number, website, etc. The name, address and phone number (‘NAP’ in SEO terminology) are crucial. You should use the same NAP on every website and directory such as Yelp, Yellow Pages, etc. A high NAP consistency tells Google that your business is legitimate and thus, will rank higher. Make sure to fill in your address accurately. Also ensure that your map marker location is accurate. Google will send a mail to this address to verify it. Add a link to your website. If you don’t have a website, use free Ecwid Starter Site. Use a working phone number. People must be able to reach you at this number. Add your working hours/store hours. This covers the basics. Besides these, there are a few advanced tips we’ll cover below. On the main listing page, you have the option of adding categories for your business. At the very least, you should have a single broad category that accurately describes your business. You can add additional categories to help Google further understand your business and its products. However, make sure that these additional categories decompose down in specificity, not up. For example, if you run a pizza place, your main category should be pizza takeaway. Your additional category, however, shouldn’t be Italian takeaway. Pizza, being Italian, is automatically covered under Italian food. Instead, try adding additional services you offer. If you offer delivery and dine-in along with takeaway, add pizza delivery and pizza restaurant. Don’t go overboard with this. Limit yourself to 5 categories at most. 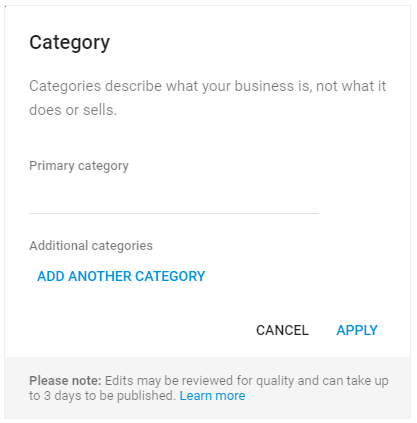 Besides categories, you can also tell Google about your business’ attributes. 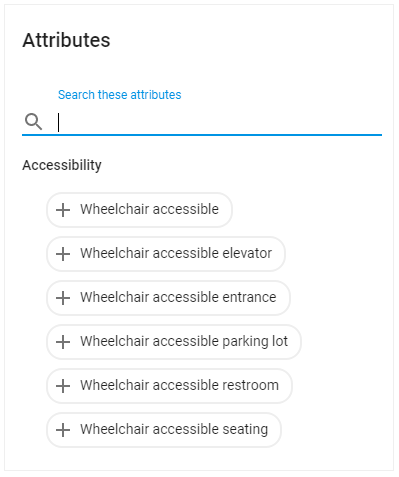 This is again accessible on the edit page and includes several options such as accessibility features, amenities, etc. Be honest here and choose only the most accurate attributes. Not doing so will just lead to disappointed customers. Pictures are quickly becoming a big part of your business listings on Google. On your business page, there is even an entire section devoted to pictures of the business. At the very least, you should have the basic identity pictures — a cover photo, logo, etc. Beyond this, you can also include pictures of the business’ exterior, interior, products, and the people who work there. Basically, the more pictures you can have, the better. Google Posts is a new service where users can create content right on Google which will show up near the top of the page when someone searches for their name. Google Posts aren’t meant to be blog posts. For one, they disappear within a week. So instead of evergreen content, you’re encouraged to share timely and relevant information in Posts: new promotions, an event, etc. Google Posts is still a new feature which didn’t become widely available until June 2017. Read this article to get a quick guide. You can create Posts right from your GMB dashboard. Follow the instructions on this page to get started. Reviews can make or break your listing on search results. Your overall rating (as determined by your reviews) shows up prominently when someone makes a local search. When someone actually clicks on this pack of links (called a Local Pack), the reviews dominate the listing. Getting more reviews, therefore, is crucial for getting a better ranking. Make it easy to leave reviews by including explicit instructions. Don’t assume that your customers know how to get their way around search engines. Time the request right. Don’t send the request too soon after a purchase; it will seem too opportunist. Don’t delay it too long either; people are liable to forget about you. Time it such that your business is fresh in your customers’ minds. Use the review request in your emails. If you’re capturing your customers’ emails, you should include the review request in your welcome email to new customers. Never use fake reviews or write reviews yourself. Google is smart enough to sniff out fraud. Don’t ask customers to leave reviews using your iPad when they’re shopping in your brick-and-mortar store either. Google can spot too many reviews from the same IP and might flag them. 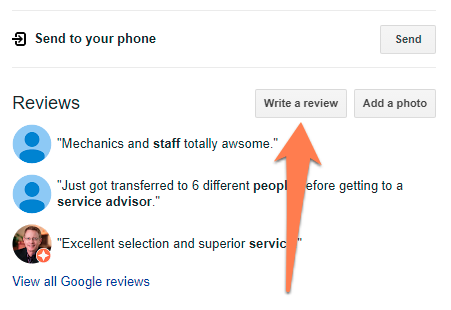 Also, keep in mind that you can’t delete reviews from Google My Business. Be careful about who you ask for reviews. People will sooner leave negative reviews if they are unhappy than positive ones if they are satisfied. To avoid unfairly low ratings, follow up your happy customers intensively — say, people who’ve shopped from you multiple times or have other positive experience signals (followed you on social media, shared your page, left a review in your online store etc.). 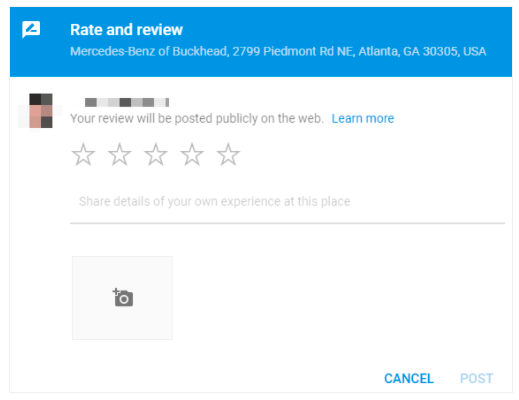 What link should you send to customers to get reviews on Google My Business? You can copy-paste this URL and send it to your customers to collect reviews. As we saw earlier, there are a number of other off-site components that contribute to your local SEO success. Adding your website to local business directories and websites such as Yelp. 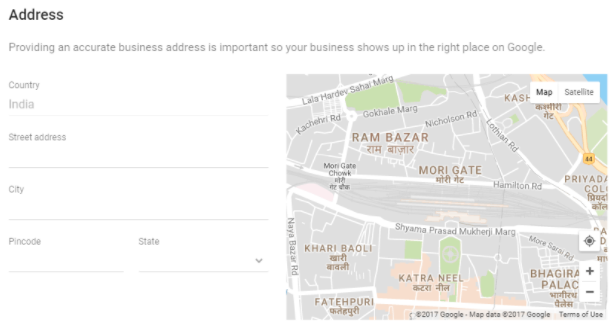 Use the same address and phone numbers as your GMB listing. This is called building citations. Ask local bloggers, websites, newspapers, etc. to link to your site, especially in pages such as best X in Y city. Share your website link on social media. Create valuable content to attract customers. For now, optimizing on-page SEO and My Business signals will go a long way towards improving your rankings. Plus, since these are easy to do, tackling these first will be a lot less resource-intensive than embarking on an expensive SEO campaign.